Ask fellow campers about "St. Mary / East Glacier KOA" and nearby attractions. Nice KOA with beautiful views of surrounding mountains, long level pull through site, properly placed utilities with adjacent patio with furnished chairs, table and butane bar-b-que grill. Very nice camp store with a wide variety of supplies, including coffee and ice cream, and clothing and equipment. We had to leave two days early as snow was coming in and park cheerfully refunded one night's charge without us even asking for it. Easy to find right off highway 89 and very quiet with no traffic noise. East entrance to Glacier National Park a short drive away. No wifi, but a very strong Verizon signal. A beautiful place we hope to return. We camped at St. Mary / East Glacier KOA in a Motorhome. With sites starting at $80/night, this is one of the most expensive parks we have ever stayed in. While the park itself is nothing special, it is very close to the East Glacier entrance, and about 1/2 hour drive from the spectacular hiking in Many Glacier. Sites are a real mixed bag with some being very unlevel (front tires hanging off the ground) to dirt/mud side yards, to relatively level sites with nice grass yards. If you don't mind back in sites, they seem to be more level than the pull throughs with most sites in section B being fine. We were in B14, which was level and a huge grass side yard. Unfortunately, zero AT&T service, but surprisingly, the park WiFi worked really well at our location. Good Verizon and open sky for satellite reception. Dog friendly with bags and waste stations around the park. Very nice camp store. We won't rule out staying here again, but will check out alternative locations. We camped at St. Mary / East Glacier KOA in a Motorhome. Expensive park due to prime location, mountain views, and extra amenities like pool and hot tub, trails, etc. Has store, laundry, on-site food (wildly over-priced) even with pizza delivery to your site. Roads and sites were gravel, mostly level although I saw some blocking used, so rather site-dependent. Site we were assigned just barely fit us (34 ft fifth wheel) and truck, but there were others that accommodated bigger units, so you get placed accordingly. Maneuverability was adequate. Very nice, well maintained private bathroom/shower facilities, although a little bit more capacity for size of park would be good, as there were occasionally lines to use them. No cable, and no over the air TV reception or even radio stations! Park was pretty quiet the 11 days we were there, despite being fairly full most nights. Had a brief power outage in park one night, no apparent reason according to park staff. In our row, sewer connections were badly placed at far rear of sites, requiring 20-25 feet of hose minimum. Overall, park is a bit overpriced for the poor WiFi and lack of cable TV, despite the prime location close to Glacier east entrance. They really need to invest in WiFi upgrade and stop joking about how bad it is with customers at check-in, especially since there is no cable. We camped at St. Mary / East Glacier KOA in a Fifth Wheel. As of our stay, diesel is 40-cents cheaper in Browning than in St. Marys., and there is nice, reasonably-priced IGA supermarket there too, if you are willing to make drive. Take Route 464 if towing mid-to big size rigs coming from Browning as noted on park web page. It's a nice park with lots of amenities and conveniently located to the entrance of Glacier National Park. It is situated in the middle of a meadow so there is no shade. Full hookups worked well as well as Verizon cell. Sites are close together. The roads within the park are dirt so anything left outside will get covered with a layer of dirt. We camped at St. Mary / East Glacier KOA in a Motorhome. There is a very small grocery store in St Mary's with limited items and high prices. People were very nice. 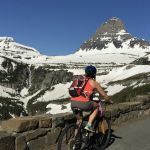 Understand the short season and the proximity to Glacier but $80 to park in what amounts to a pasture is just too high. We camped at St. Mary / East Glacier KOA in a Motorhome. Nice enough park but $80 night is silly - there is NO Wifi or ATT service at all - they should not be advertising Wifi that doesn't exist. 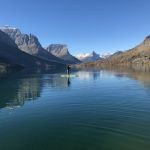 Great location for the East side of Glacier which in my opinion is the BEST side - hubby enjoyed the pancake breakfast as well. We camped at St. Mary / East Glacier KOA in a Motorhome. Disappointed by the unkempt grounds. The park is very dated and needs tidying up. Store was well equipped and the proximity to Glacier NP is an asset. Beautiful mountain views. No Cable or Wifi. We had a red fox visit occasionally. The price is worth the proximity to the beautify Glacier National Park. We camped at St. Mary / East Glacier KOA in a Fifth Wheel. Try the Graham Slam ice cream, its fantastic! So are the cinnamon rolls. This is a very nice park. However, the rates are high considering that the WiFi is non-existent. If you are charging $100 per night (No KOA discount), you should invest in infrastructure and have adequate WiFi. The staff is fairly young. Mostly high school or college. Many on Work Study programs from foreign countries. Called the CG and told them a USPS package would be coming. Verified address. USPS tracking showed package was delivered 2 days PRIOR to arrival. They could NOT find it. Had to visit the office TWICE and finally it "appeared". My name was correct. They had even "noted" the arrival date and my site number. BUT, it got "LOST" in the back room. The CG is owned by a couple. The lady is sharp. She straightened out the KOA "home office" on our Value Kard. However, the main staff is not that well trained. We had to elevate a small issue to her level to get it fixed. We were in the sites across from the pool. These sites are NOT level. One 45 Ft MH had the front tires raised 12" off the ground. Our Air Level (not Jacks) suspension did not have enough travel. We were a bit "sloped" but could not move. We camped at St. Mary / East Glacier KOA in a Motorhome. East Glacier is NOT as crowded as the West Side. Go to the Many Glacier. Lots of wildlife there. Take the "two boat" tour from the hotel. Really cool. Rate includes 10% KOA discount and $100 discount for Rewards Card points. Site was pull-through; gravel; level; FHU with 50 amps. There was a picnic table available, but was on unlevel ground. We had good Verizon cell and internet reception and good DishTV satellite reception. The park has nice views of the surrounding mountains. The park was quiet at night. We would stay here again. We camped at St. Mary / East Glacier KOA in a Motorhome. We find the east side of Glacier National Park less crowded than the west side. 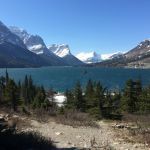 It has easier access to the entrances at Many Glacier and Two Medicine, it is a shorter drive to get to Logan Pass, and is closer to the Canadian border and Waterton National Park. This is the third time over the last six years that we have stayed here. Some sites are level and some aren't. Ours was not on this last visit. One thing that is consistent is the wifi, its worthless. They shouldn't even advertise that they have it as it has never worked for us on any device. The staff are friendly but don't have any explanation other than it might be down or too many people are using it at the moment. We camped at St. Mary / East Glacier KOA in a Motorhome. This is a very nice park, although in my opinion it is pricey. Staff was very friendly and helpful. I particularly liked one feature: at your convenience you can order a pizza (which is very good) in the office and tell them what time you want it delivered to your campsite. That was a very nice perk. One thing I did not like - their internet and phone service is nonexistent unless you are a Verizon customer. We also had no TV service. We could not cook out because the wind was so bad, we were afraid we would start a fire. Other than those inconveniences, the campground was good. We camped at St. Mary / East Glacier KOA in a Motorhome. We reserved a deluxe patio site. It was not at all level--and almost impossible to fit our 40 ft motorhome with tow in the site. It was sleeting with 70 mph wind gusts, so we weren't happy about all the extra effort trying to set up. Eventually we had to move to another site. The regular less expensive sites were longer than the deluxe. Fortunately, the campground staff was able to accommodate the change. The wind nearly tore the door off RV and car ever time you opened it. Trash was blowing everywhere. In fairness to the campground, not much they could do about the wind, but we would not return. We camped at St. Mary / East Glacier KOA in a Motorhome. Nice enough setting with the mountains, but the site was too sloped, and the internet mostly non-existent. Don't advertise it if it doesn't work. We camped at St. Mary / East Glacier KOA in a Travel Trailer. 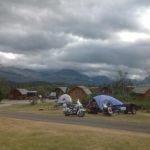 Big campground with spectacular mountain views and close to Glacier National Park east entrances. One of best campground stores we have ever seen. Very friendly and helpful staff. High camping prices but paying for location. Only drawback was very high winds for three days which is evidently not unusual for this area. Also had issue with power plug location which was too far forward so could not park our class C at rear of site where it was more level than front of site. We camped at St. Mary / East Glacier KOA in a Motorhome. This is our 3rd time to Glacier (2nd on the East side). We prefer the East side simply because it is quieter and has more natural beauty around the camp site. The view of the East entrance to Glacier NP is simply breathtaking. 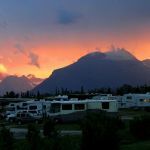 In our view, this rv park is the best available on the East side. They could definitely use more gravel on the interior roads and pads. We happened to arrive right after several days of rain which resulted in our coach almost getting stuck in two sites before we found nice worker helped us find a dry one. At the price you pay, we were a little disappointed that they would not allow us to select a site of our choice. There were few people there, and the site we selected we were told was taken. But no one was there all week. The campground store offers ice cream, a coffee shop and a nice supply of groceries. There is a field directly across from the entrance to the CG. On our first night there, we saw deer and a large elk herd (20+). We were there early in May so most everything was closed...St Mary Lodge, most of Glacier NP, grocery store, etc. However, having few people around enabled us to see at least 7 bears in Glacier NP, lots of elk, moose, mountain goats, big horn sheep. If in the area, we would come back again. We camped at St. Mary / East Glacier KOA in a Motorhome. For viewing big horn sheep and mountain goats, go to Many Glacier. Don't forget to see Chief Mountain about 8-10 miles up the road. Watch for cattle on the road into the park because they run loose. There is wildlife viewing in the area if you get out early. We saw moose, deer, and grizzlies. We felt safe hiking in the park without bear spray but you better have it if you are hiking in Glacier. Great access to the Glacier NP St. Mary entrance and visitor center. There is more wildlife on the east side but you need to look for it. I feel the east side hikes are better too. Iceberg Lake hike was great - take binos. Browning has a great but small Plains Indians museum, most of the very unusual artifacts coming from private collectors or the Northern Railroad collection - a bit of history preserved. And if you're buying diesel, fuel is 25 cents per gallon less in Browning than St Mary. Have dinner at Johnsons of St Marys. Hike the Iceburg Lake Trail at Many Glacier. Have an ice cream cone nightly at the KOA shop! Also went to Medicine Two and Many Glacier and got out of the smoke. They are a must if u have the time. The going to the sun road was quite smokey but we still love it. Very convenient to Glacier National Park. 2 miles to the East entrance of Glacier National park. Close to restaurants and grocery store. After a long day of hiking the hot tub was amazing! Clean Clean Clean!! Breakfast, pizza, and BBQ available in the park. Short walk to a lake. Good places to walk the pups. Eat at Two Sisters, about 5 miles north. Fun place, always packed. Come with everything you expect to consume. The grocery-everything store nearby is more like a big 7-11. If you go in early summer, darkness doesn't come until after 11. Water quality is good. No need for bottled water. The pizza joint, Rising Sun, was awesome. Good wings and pizza. A little bit pricey, but good. Small town nearby, gas for cars, and can get motorhome in, if you are careful. Best RV gas in Browning. Great hiking in the area. Thought the scenery was more dramatic over West Glacier. Glacier NP is one of the best I have been to. The welcome center of the park was excellent and well worth a visit. We saw Grizzly bear and young cubs. We found there was very limited food shopping in the area and would recommend stocking up with provisions before arriving, if you are expecting to cook at home. The campsite recommended we take the 464 from Browning to Babb and not use the 89 as it is very steep and twisty. This was really good advice and although a few miles longer was a much easier route into the area. Take care of internet or phone business before coming to the area. The red Jammer bus tours will pick up at the KOA office, and are lots of fun. DO NOT use US-89 to travel here from Browning; it's a dangerous, narrow, up & down, curving road through the Blackfoot reservation with un-fenced livestock at the roadside, ending in a long, steep, dangerous, downhill entry into town. Even with engine braking, could smell brakes after arriving. Instead use MT-464 connecting to US-89 just north of St. Marys, and go south a few miles into town. There is no ATT cell service here. Be sure you bring everything you need for your stay. There is only a small grocery store that is really more like a convenience store with convenience store prices. If you are coming in from Browning, MT do not take highway 89. It is a narrow windy road and is difficult with a motorhome or towing a trailer. Instead take highway 464, which is somewhat longer, but it is a wider, straighter road that comes in North of St. Mary so you have to backtrack a little. The receipt you get from the KOA does mention this, but it is down toward the bottom of the receipt where few people will read it. If you really need to make an AT&T cell phone call you can head towards Babb or Browning and get a signal. Closest place in Babb near entrance to Many Glacier Hotel Road. Stock up BEFORE arriving St Mary. Minimal grocery/supply shopping in the immediate area. Beautiful scenery. This place is close to the East entrance to Glacier and everything in the area supports that. Explore in a tow car or truck, can't take most RVs into the park due to roads. Pizza, which is delivered, is good. Park Restaurant just at the end of town is excellent. Pie is delicious. Store next to the restaurant doesn't have much. Didn't try the main store downtown. Waterton Lakes is a nice trip - don't forget your passports. Many Glacier and Two Medicine Lake are really pretty. Trip to Logan Pass is a must see. Stock up on supplies before arriving. St Mary has a gas station and a small supermarket with limited selection. It's the only place for diesel on this side. Don't miss the Many Glacier area or Waterton Lakes NP in Canada (but you'll need a passport). We highly recommend the Going to the Sun pizza at the KOA! The breakfast was tasty also. By all means, do go to Glacier National Park. However, bring your supplies with you. St. Mary MT does have a grocery store, but it is rather minimally supplied. The campground is almost as well equipped. The Canadian side of Glacier is easy to get to, but in our opinion, it is no more beautiful than the American side. It's worth a trip if you have the time, but don't feel cheated if you don't have time (or a passport). There is a Nice visitor center. I suggest buying supplies before you leave a big town. Make sure you stock up on groceries. The local store only has basics. The nearest larger grocery store is an hour away. Route 89 from browning at this writing was ripped up for about 5 miles. Dirt only. There was no detour sign. 465 is a better RV option. Easier drive. 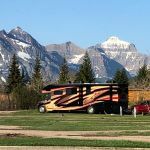 This campground is perfect for exploring the east side of Glacier National Park, going up to Logan's Pass on the Going-to-the-Sun Road, and also visiting Many Glacier. It's also close by to Waterton Lakes National Park in Canada. You can reach everything on the east side if you leave early for your exploration. Perfect Cuts butcher shop and the Super 1 in Columbia Falls are great! There is so much to see and do at the East Glaciers so do your homework so you take advantage of everything here. One of the best hikes is at Logans point. Make sure you take the hike all the way to the lake. Amazing sights and wildlife. Glacier National Park entrance fee isn't collected until 8AM allowing for early entrance at no cost. The KOA makes pizzas and will deliver right to your RV, however we were both very disappointed in the pizza and would not recommend. Go down to the nearby St Mary River and dip your toes in the ice cold water and enjoy the views. The Red Bus Tour picked up right at the campground. We enjoy hiking and found East Glacier (rather than West Glacier) to be more convenient for many of the hikes and side trips we wanted to do. Our next stay in East Glacier will be inside in the National Park even though there will be no hookups. Much more economical with beautiful locations. Are you affiliated with St. Mary / East Glacier KOA ?